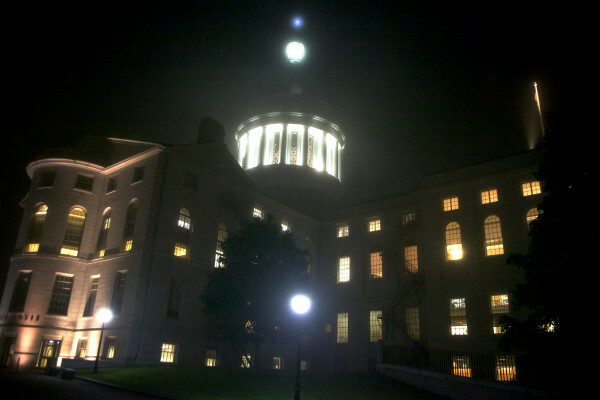 The State House shines through the the fog in this June 16, 2015, file photo. AUGUSTA, Maine — The enactment and enforcement of laws is a core function of government, but the increasingly dysfunctional environment in Augusta has thrown even that basic civic process into chaos. For the last week, the fate of 71 bills sitting on Gov. Paul LePage’s desk has been the subject of controversy. All were enacted by the Legislature. LePage has said he’ll veto most if not all of them, but he hasn’t sent them back to the House or Senate for override votes. LePage says lawmakers prevented him from sending them the bills when they left Augusta on June 30 and that he can hold the bills until legislators come back for four days, at which point he’ll send along the vetoes. Democrats in the Legislature — and, privately, several Republicans — say they did not prevent the bills’ return. They contend that all the legislation has become law because LePage didn’t act on the bills within the 10-day window the Maine Constitution gives him to do so. The constitutional staring contest has drawn celebration from Democrats and activists who say the governor botched his veto attempt, as well as fierce criticism from some conservative circles where activists say LePage’s gambit prevented him from killing signature liberal efforts such as a bill to ensure welfare for asylum-seeking immigrants. The issue also has drawn consternation from observers and the media about just what is going on in Augusta. Here’s our best shot at answering that question. Are these bills law or not? No question is more central. If these bills are law, LePage will have missed his chance to veto and will have to start enforcing them, whether he wants to or not. If they are not law, the Legislature will have to convene a special session and twiddle its thumbs for three days until LePage sends the vetoes down for override votes on the fourth. The question is far more than academic. If LePage still has time to veto the bills — as he believes — there is a good chance some of those vetoes would be sustained by the Legislature, killing the bills for good. Two-thirds support is needed to override a veto. Neither majority Republicans in the Senate nor majority Democrats in the House have large enough numbers to meet that threshold themselves. The GOP caucus in the House is especially keen to have its chance to kill the welfare-for-immigrants bill and, to a lesser extent, a bill to expand state-funded family planning services to more low-income women. Wait, back up. Why is all this happening? LePage and lawmakers have two different interpretations of the current posture of the Legislature. The governor says it “adjourned” on June 30, while lawmakers say it simply is in recess. That’s important because Maine’s Constitution says the governor has more than the normal 10 days to act on bills if the lawmakers have adjourned and “by their adjournment prevent” the bill’s return. Lawmakers did pass a temporary adjournment order on June 30 but did so only to give LePage 10 days to act on the bills. They planned all along to return on July 16 to take up any vetoes and finish business. This kind of temporary adjournment is standard legislative operating procedure and normally is considered different from “final adjournment,” which happens at the end of a session. No one questions that lawmakers meant to recess, but LePage and his attorneys say what they meant to do is irrelevant. What matters is that they’ve adjourned, he argues. The background for all this chaos is the acrid relationship that has developed this session between the governor and the Legislature. Lawmakers are investigating LePage for potential illegal or unethical overextensions of power. By the end of the session, the governor had pledged to veto every single bill enacted by the Legislature in an effort to waste lawmakers’ time as retribution for what he claims were five months lawmakers wasted his time earlier this session. There are those in Augusta who believe the chaos created by the delay in gubernatorial action on the bills in question is just another effort by LePage to throw a wrench in the gears of government, though LePage says it’s simply a question of proper procedure. “If I’m wrong, so be it. It’s not about who’s right and who’s wrong. It’s about let’s do it correctly,” he said. Most observers agree that ultimately the state’s Supreme Judicial Court, acting as the Law Court, will have to decide the constitutional question of the governor’s veto timeline and the definition of adjournment. Either the governor or the Legislature can request such a ruling. Democrats hold, however, that no resolution is necessary. Backed by Attorney General Janet Mills, they are so convinced in the validity of their own legal argument that they don’t even see room for dispute. LePage’s spokeswoman, Adrienne Bennett, has said the Legislature could easily erase the controversy by agreeing to meet for four days, at which point the governor would send along vetoes for override votes. House Minority Leader Ken Fredette, a Republican, is open to that option, but Senate President Michael Thibodeau, R-Winterport, and Eves, D-North Berwick, said they would adjourn session Thursday, after clearing the remaining agenda in just one day. LePage, however, told radio station WVOM on Tuesday that his office was preparing such a request for the Law Court. Great! Let’s get that request in and get this answered. Not so fast. While LePage has said he’s drafting a request for an opinion the Law Court, his administration has sent mixed messages about how soon he would submit that request. In a letter to legislative leaders, LePage’s attorney, Cynthia Montgomery, said the request would be filed “in short order.” Bennett said Tuesday that no firm timeline has been set. On Monday, LePage told Maine Public Broadcasting Network that he may wait until January to do it. In a way, January makes the most sense. LePage believes he must hold vetoes until lawmakers are in session for four days. Unless there’s an unanticipated special session, that won’t happen until January. At that point, LePage would deliver the vetoes. The Democrat-controlled House would consider them out of order and refuse them, according to House Majority Leader Jeff McCabe, D-Skowhegan. That’s likely when LePage would seek the court’s opinion, if he does choose to wait half a year. But whether he’ll really wait seems to be anyone’s guess. While Democratic leaders today seem unenthusiastic about filing their own request to the Law Court — doing so would, after all, be an admission that there’s a dispute — it seems untenable to hold that position until 2016. Nonemergency laws take effect 90 days after final adjournment. Lawmakers who believe the 71 bills in question are law likely will feel compelled to act come October, when LePage refuses to enforce the bills — or laws — in question.